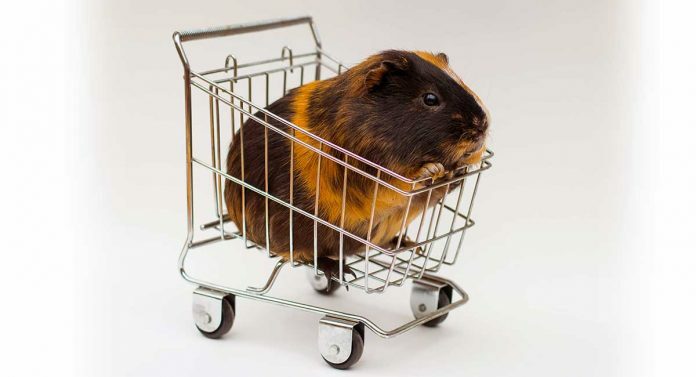 In this article, we’re going to discuss where to buy guinea pigs. Guinea pigs make great pets! Guinea pigs can make great pets for the right household. Their mannerisms are quirky and charming, and if they are handled carefully from a young age they often become very attached an affectionate towards their owners. They are rarely aggressive, and require the kind of care that older children can easily help out with to learn about caring for animals (but their welfare and care should ultimately be the responsibility of an adult). You can’t keep a guinea pig outside all winter – they will not thrive in the cold. That means you’ll need a warm shed in which to keep your guineas’ hutch, or an indoor cage for the cold months. Guinea pigs need exercise to keep them healthy and happy. An outside run is therefore important, as well as a roomy cage or hutch. Have you got time for guinea pigs? Guinea pigs cannot be fed and left to get on with it! You will need to invest time in cleaning out their cage, and in grooming and handling them every day. How much does it cost to keep guinea pigs? In addition to a suitable cage and an outside run, there are other piggy keeping expenses to bear in mind. Vet bills are part and parcel of owning any pet. As is the cost of food. Guinea pigs can present a tempting toy for dogs and cats that have a strong hunting instinct. Contrary to popular belief, guinea pigs and rabbits can’t be kept together! If you’re still keen to go ahead and get a guinea pig, you’ll need to know where to buy guinea pigs. And we’re going to look at that now! All these options have pros and cons. How much are guinea pigs? Guinea pigs can cost anywhere from $10 to $40, depending on the breed of piggy and where you buy from. If you get a guinea pig from an animal shelter or guinea pig rescue center, you will usually be asked to make a donation to the shelter, rather than pay for the animal itself. Fancy cavies that are bred for the show ring will undoubtedly be more expensive than “ordinary” pet shop piggies. However, if you want to have fun taking your pet to cavy shows, you’ll really need to spend more and buy a pedigree pet. Your first port of call when wondering where to buy guinea pigs might be your local animal shelter. There are many, many unwanted piggies and lots do end up in shelters or at guinea pig charities. Check rescue center websites for more information and to see if they have any piggies available for rehoming. In the US, the ASPCA is your first stop, but there are lots of rescue centers that take in unwanted piggies. In the UK, the RSPCA and Blue Cross animal charities have lots of unwanted guinea pigs that are waiting for a forever home. Don’t assume that guinea pigs end up in rescue shelters because there is something wrong with them. When you take a guinea pig from a shelter, it should come with a full health check, so you know that your new pet is healthy. One drawback is that the age of the guinea pig may not be known, only guesstimated. Hopefully you will also find that rescued piggies have been well-handled, so you won’t have to spend time taming your new pet. 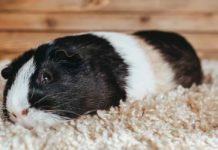 If you want a particular breed of guinea pig or a show-quality animal, your best bet is to contact a registered breeder. You will undoubtedly pay more for a pedigree pet. However, if you want an unusual breed, or a pig that you can show, a breeder is the best place to start looking. 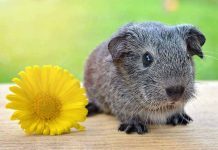 The American Cavy Breeders Association has a full list of registered guinea pig breeders in the United States. Your local cavy club will also be able to recommend a good local breeder. When planning on buying a piggy from a breeder, it’s sensible to check the seller’s reputation first. Ask at your local vet practice to see if they know the breeder and try Googling too. You should ask to see the piggy’s parents. Any reputable breeder will be able to provide you with a full family tree for their stock. A family tree will enable you to rule out any excessive inbreeding that could cause inherited health problems in the offspring. Ask your breeder how many litters they rear at a time. The more they have at once, the less time they’re likely to have for handling and socializing the pups, which means more work for you! 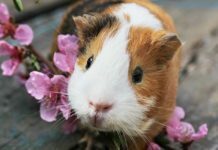 Although there are lots of very reputable pet stores that sell guinea pigs, there are a few potential issues with taking this route when deciding where to buy guinea pigs. Many pet stores won’t be able to tell you where they obtained their guinea pigs. Some pet shops buy from breeders, but others take unwanted animals from local owners whose piggies have bred indiscriminately. Unknown breeding means that you won’t know anything about your pet’s parents, temperament, and potential inherited health conditions. Like many small furries, guinea pigs are very sensitive to stress. Guinea pigs sold in pet stores may have been moved several times already, potentially causing stress and upset that could affect their temperament and health. A stressed guinea pig will be more likely to contract diseases and pick up parasites from other pets too. Look at the guinea pig’s overall condition. A healthy guinea pig should be neither skinny nor fat, and there should be no swellings or lumps on his skin. The guinea pig should be bright and interested in his surroundings and in you. A lethargic, disinterested piggy is most likely sick. The guinea pig’s fur should be smooth, full, and fluffy. There should be no thin or bald spots. Look closely at the piggy’s rear end. There should be no soiling, which could indicate diarrhea, a serious health problem for guinea pigs. The piggy’s eyes, nose, and ears should be clear and free-from discharge or crustiness. The guinea pig’s teeth should be not be overgrown or crooked. Matted fur on the chin could indicate a dental problem. There should be no wheezing or clicking sounds when the guinea pig breathes. The guinea pig should move freely and with no signs of lameness or stiffness. The guinea pig may be skittish at first, but when calm, you should be able to handle him relatively easily. Never take home a guinea pig whose cage mates are showing signs of sickness. Your guinea pig may be carrying a disease that doesn’t show itself until you get your new pet home. Finally, always ensure that male and female guinea pigs are kept separately. If the shelter, breeder, or pet store doesn’t seem sure of the gender of the piggies that are sharing a cage or run, it’s best to move on. You don’t want to end up with a pregnant piggy and a whole litter of guinea pigs you can’t keep! Where is the best place to buy guinea pigs? Guinea pigs can make great family pets, but they do need lots of care and the correct environment to keep them happy and healthy. If possible, get your next guinea pig from a shelter. There are lots of unwanted piggies that finish up in rescue centers and offering a forever home to one or more of them will help to ease the burden on animal charities, as well as making at least one unwanted piggy very happy! Have you bought a guinea pig recently? Why not tell us your story in the comments section below? King, J. A. (1956). Social relations of the domestic guinea pig living under semi-natural conditions. Ecology. Sachser, N. & Lick, C. (1991). Social experience, behavior, and stress in guinea pigs. Physiology & Behavior. Previous articleFat Hamster – Does My Hamster Need To Lose Weight? We got a guinea, 2 month male at the pet store last week. He is a bit shy, unlike other guineas I’ve had, but I’ve also never owned a baby before. Thinking about introducing another male, but have read horror stories and don’t want to scare the little guy. Any advice is greatly welcomed. Clearly, I’ve made all the mistakes. Got guinea at pet store, and got cage the pet store recommended. His cage is too small! So might try a bigger cage first then a buddy?